NOTE*** The content on this page contains affiliate links, meaning I receive a percentage of the product purchased at no additional cost to you. I appreciate your support. More information on the disclosure page. 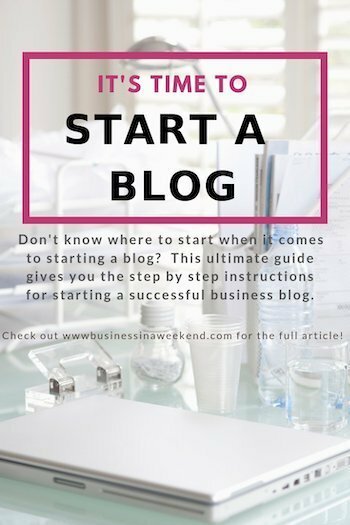 Have you been thinking about starting a successful blog for your business? 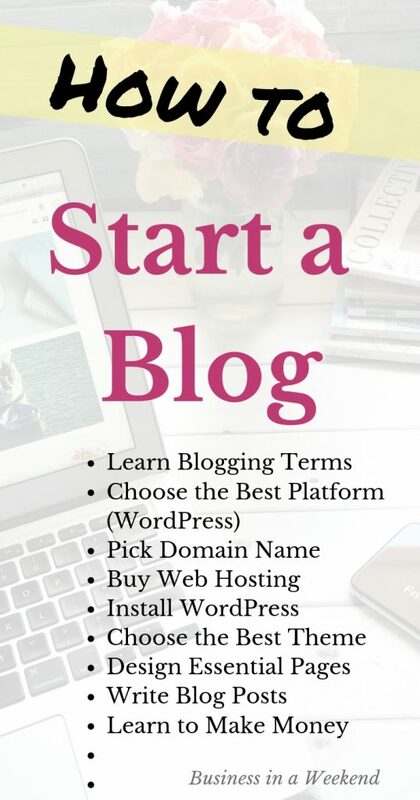 I have created this step by step guide to help you learn what a blog is, the terms you need to know and how to start a blog from scratch. If you have looked into starting a blog lately, you are probably overwhelmed with the amount of information out there on the internet. This ultimate guide will help you start blogging on your own WordPress website without any technical knowledge. But wait, what if you are not sure of WordPress is right for you? Not to worry, I cover choosing the best blogging platform. And before that, you will learn what is a blog and terms like “blogging platform”. Take a breath – you’ve landed at your blogging home. I’ve already scoured the internet for all the answers, made a bunch of mistakes by trial and error and did all the stressing out for you. Now you can enjoy this tutorial. Now let’s focus in and get down to business at hand: starting a profitable blog on your own Word Press website. Are you still with me? Let’s get deeper into the details of starting a profitable blog from scratch. You may be wondering what is a blog and how is it different from a website. Simply put a blog is an online journal or diary of information posted on a website. The term originated from the word web log where the author writes regular updates in the form of a journal. You might think of the website as a binder that holds the information and blog posts are the new papers or entries you continuously add and update. A business could have a website with static pages that don’t change and not have a blog on the website. I have seen many small businesses with this type of basic website, with a home page, contact page and another page or two. If you simply want to create a WordPress website before committing to blogging you can follow my step by step tutorial to set up a business WordPress website this weekend. Adding a blog to your website can serve many purposes including the ability for future customers to find you on the internet and growing a relationship with current customers. To matters more confusing, many people refer to a website with a series of blog posts as a blog. Businesses often use the terms website and blog interchangeably. I frequently refer to this website a blog and, therefore, I am a blogger. So now that you have an understanding of the difference between a website and a blog, I’ll cover more blogging terminology. Web design and blogging have specific terminology that you must become familiar with to be a successful blogger. I have seen new bloggers get lost in all the jargon, so will define some of the key terms that you need to know. You need to be familiar with important blogging vocabulary if you want to be a professional and make money blogging. If you need an ultimate list of website and blogging terms, I have a list of over 100 terms you need to know here. The basics will get you started so you can follow along with this tutorial. Domain Name – Your unique name for the location of your website which looks like www.mybiz.com. URL – Uniform Resource Locator is the address of a specific piece of information (webpage, blog post, image, etc) on the internet. Content Management System (CMS) – software designed to organize and manage the creation and modification of digital content. Web hosting service provider (web hosting or hosting) – a company the provides the servers, technology, and services that store the information for your website and allows it to be viewed on the internet. WordPress – an open source content management system that you can use to build a website without knowing the code. Theme – defines the layout and appearance of your website. Plugin – software that is loaded to your WordPress site and extends the features and functionality of your website. I will continue to define more terms as you read through this blogging tutorial. I am going to say something totally different. Yes, starting a blog is like anything in life and there will be ups and downs. You will have times when you want to give up. And …I joined one of the best all-around support groups for starting a blog. I have taken individual courses and joined FaceBook support groups but this one ultimate resource has been the most helpful to me. This is an all in one – courses, support group, community – kind of thing. Paul Scrivens, or Scrivs, the owner of Dare To Conquer (formerly BBC) founded his group to be this way. Scrivs mission is to help each student achieve their goals and a better life for themselves through money making blogs. Honestly, I have had the most benefit from the mulitiple courses and the community of bloggers here. Just the Pinterest tailwind tribe blows away any other tribes. So if you are serious about starting a blog for profit and you need more help than this tutorial can offer, I suggest becoming part of the Dare to Conquer family. In addition, I suggest you join a Facebook group for aspiring bloggers. They encourage support and give you any feedback when you are stuck. Make sure to follow the Business in a Weekend page where I post tips for growing your business online. Hang out, get to know some bloggers and see how they are promoting their blogs. You can ask questions any time you get stuck. I am always here for you too. So, find your way around Business in a Weekend website, ask questions in the comments, and of course reach out to me via email or schedule a 20-minute strategy session. We don’t even need to talk strategy – maybe you just need some encouragement! If you already have a business, you will need to be really clear about the audience that you are trying to reach with your blog. To start laying the groundwork for a blog you have to decide what exactly you will be writing about. You do not need to be an expert on a subject to start a blog. The content should be related to the product or business you are trying to promote. Many people start a journey blog that documents the trials and errors in becoming an expert on the topic. Neil Patel with Smart Passive Income is a great example. The Dare to Conquer blogging courses cover this in depth. Scriv’s not only teaches blogging but he has many money making blogs – like not a little money but like 5 and 6 figure money making blogs he runs beside DTC. He has plenty of advice on the blogging niches that are actually profitable. Sure, DTC will help you monetize any blog, but he covers the best niches in depth. If you want to start with some free advice in this area, sign up for the DTC 14 days blogging boot camp. You have likely heard of Wix, Squarespace, blogger, and WordPress. Oh, I was so confused when I first started. And then to add to the confusion there is WordPress.COM and wordpress.ORG. Choice 1. Do you need just a couple of landing pages for a website? Likely not, or you would be reading about how to build a website and not trying to learn about blogging. Do you want to use a free platform that you do not control or own your blog and will be difficult to monetize? When I started online, I had no idea about building websites. So I started on Wix. That website is still up as a portfolio because I can’t move it to WordPress or monetize it. The problem with using a free platform that is not self-hosted is that you don’t own or control your blog, the platform does, and you can’t move the content off that platform. Choice 2. Or do you want to be self-hosted and have a fully customizable blog that you own? For a successful blog I suggest WordPress.org. WordPress.org is the most polar website management system that is used by over 70 million websites. All of my blogs are built on the WordPress platform – well except the one that was stuck on Wix. Wordpress is the best choice because you actually own your site – like a business location. If you plan to grow your business online and monetize your blog you want to have a WordPress website and blog. Yes, you will need to learn the platform, but it is quite easy. 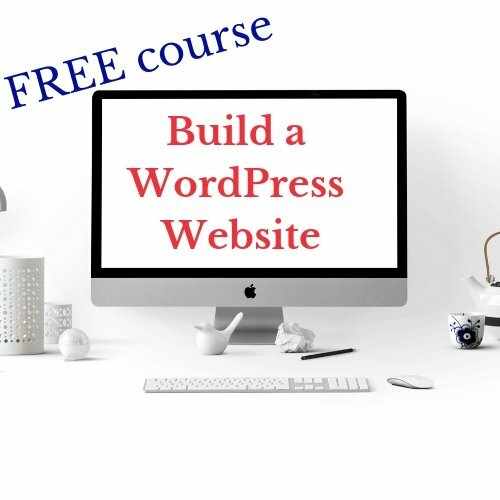 If you want to skip right to setting up your WordPress website and writing your blog – I have a gift just for you-you can enroll in my Build a WordPress Website Course for FREE here. Your domain name is the address of your blog and should match the name of your business. Or at least be similar since so many names are already taken. The domain name looks like www.YourBlogName.com. Don’t worry, most names are less than $12 a year. This step had me stumped for a long time on my first blog. Part of the issue was that I have a serious problem with making decisions. Hopefully, you will not agonize as much as I did. If you have an existing business you can try adding a location, keyword or adjective to find an available name. Write down variations of different domain names that you like. If you paid attention in step 1, now would be the time to reach out to your Facebook group or other support system and ask for suggestions. I tried this out for one of my blogs and got 6 answers within minutes. I posted 2 ideas I had and the group picked for me. Another option is to list the various ideas to a friend. Ask them a few minutes later which name they remember. This is how I chose the name for Business in a Weekend. Once you have a list of options preferably in the order of preference. Choose the option to only look for the names with a .com ending. Once you find the name you want you have 2 choices. Most names are less than $15 a year and I suggest you keep your domain name at this registrar. Note: If you do buy your domain name at NameCheap you will need to connect NameCheap and the host you choose in the next step. I have instructions in the Free WordPress Website Course. Wait and buy your name from your host. The renewal price might little higher, depending on your host but saves a couple of steps. I walk you through these steps in my FREE WordPress Website Course here. The web host is the home of your blog and all your content. The hosting company will store all the information for your website on servers and make it available on the internet. So it’s important to choose a web host wisely. Security – Your website and blog are critical for your business. I’ve tried a few different hosts and I have migrated websites between hosts. I consistently follow the discussions of website developers who deal with a huge volume of different websites. You might see bloggers promoting the same hosts over and over, but many times the end result is money for the blogger and pain for you. I have had this problem and see this in groups I participate in. In fact, I asked the question to a large group (over 2k web developers) about the best cheap web hosting for all of you. They confirmed the same experience I had, there are only a handful of managed WordPress web hosting providers that won’t leave you in tears. SiteGround is my favorite and where I host this and my other blogs. They fit the 4 most important things to look for in a host. The one thing I like best is the support. For a new blogger figuring everything out – that is priceless. The last session I had them I asked to add a domain, install WordPress, activate the SSL certificate was less than 12 minutes. Yes, you read that right, you can skip the next step by just asking SiteGround to help you! 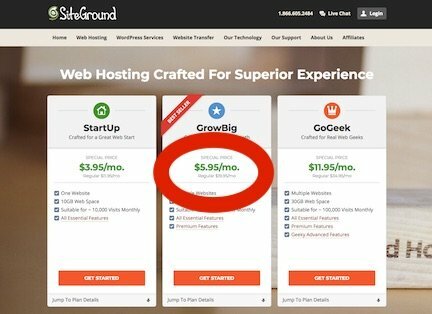 Don’t miss out on the special pricing SiteGround offers to my readers. You can lock in this price for up to 3 years! I am currently testing one other host. They are not well known in the blogging circles but the website developers love them. They give a free domain and free email too. I don’t want to promote a product until I have been able to complete rigorous testing. Comment or email me if you are interested in this additional option. If you chose SiteGround, activation and installing WordPress is easy with just a couple of clicks. When you sign up you will have an option to install WordPress. Push the button and that’s it. That is what is meant by a 1-click installation. SiteGround walks you through installing WordPress here. When you install WordPress, you will be asked to create a login and password. Make sure both are unique and secure. Remember your username and password – or write it on a little sticky note- because you will need it in the next step to login to the WordPress Admin to start building your website. After you load WordPress, you can access your blog from the address that will look like https://mydomainname.com/wp-admin/, of course, entering your new shiny domain name where “mydomainname” is written. Plus, when you signed up for hosting and installed WordPress, you received an email with the link to access your WordPress Administrator. So you if you can’t find the green button – check your email and use the link. So I just gave you three ways to login to your WordPress Admin. I save the link in my bookmarks so I can easily get back to it and I suggest you do the same. When you log into your website, take a minute to orient yourself on the WordPress Dashboard. If you want to skip right to setting up your WordPress website and writing your blog – I have a gift just for you – you can enroll in my FREE WordPress Website Course here. The dashboard on the WordPress Admin site is like your command station for your blog. *See the options on the left side? Click through the pages, posts, appearance, and plugins to see the drop downs. As you design and write your blog, the pages and posts sections will list your landing pages – such as your home page- and your blog posts. 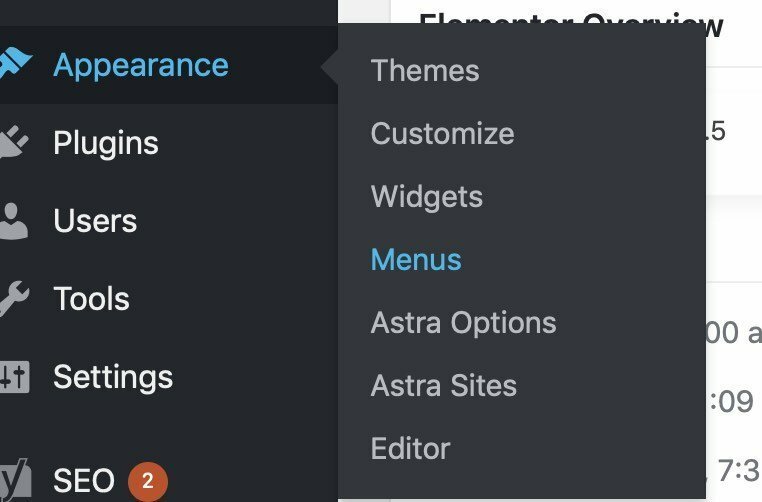 The appearance tab will list your available themes. We will talk more about themes in the next step. For now, just know it is there. If you get lost go back to the “Dashboard” option at the very top and you will return to this page. The WordPress dashboard is considered the backend of your blog and the way your website appears on the internet is the front end. The theme defines the layout and appearance of your website or how your site looks to a visitor. Think of your theme as – how you plan to decorate your house or what you want your storefront to look like. In the last step, I introduced you to the “Appearance” button where the free preloaded themes are on your site. You might be asking how to choose the best theme for your website. So many themes exist that the choice can be overwhelming. For a beginner, I have a couple of suggestions of free with an optional upgrade (freemium) and premium. In addition, I suggest using a website builder plugin. The drag and drop feature makes it so easy for you to customize your site. The next section talks about Plugins more. In general, a plugin is a small piece of software to add functionality to your website. If you choose a theme with a page builder that I suggest below, I will show you how to install the plugin in the next step. If you are bootstrapping and do not have money to invest, the Astra theme is a great option. If you have a little more money to invest I recommend Divi, a premium theme by Elegant Themes. Divi is user-friendly, has a responsive design and comes with a plethora of pre-made professional looking designs that can be loaded and customized. Because so much of your audience will be on mobile devices, you need a premium theme, like Divi, that is responsive – ie mobile friendly. The Divi Builder is included in the Divi package from Elegant Themes along with a free social media plugin. You can choose the one year license and try it out, or just go for the lifetime and never worry about paying again. A plugin is a bit of software that is loaded to your WordPress site and extends the features and functionality of your website. This shouldn’t be confused with your theme which is the whole framework. Each plugin adds special customization such as search engine optimization (SEO), displaying traffic statistics, processing payments, collecting email addresses and speed optimization. You will see the “Plugins” link on the left side of your WordPress Dashboard. This is the place to go to install the recommended plugins. Once you navigate to Plugins – locate the add new button at the top. You will need to use the search function on the right side of the page to find the recommended plugins and then activate each one. These are the basic additional Plugins that I recommend to get you started. Yoast SEO – Yoast analyzes almost everything on your post for search engine optimization and helps you connect easily to Google Analytics without adding code. Askimet AntiSpam – If you have comments enabled on your site, this plugin will help you sort the spam from the true useful comments. The number of plugins is too many for one small business owner to sift through in a year much less a weekend. So my recommendation is to start with these plugins and get used to operating and maintaining your site. As your business grows you can search for more plugins specific to your needs for your site. If you want help setting up your WordPress website and writing your blog – Sign up for my FREE WordPress Website Course. If you are starting a blog to grow your business and make money, branding is important. Start simple though and do not get hung up on this phase. (Of course, unless you love doing this creative work). Pick something that represents you and your blog and moves on to the next steps. The WordPress dashboard has a place under “Appearance” and “customize” to add branding information. Once that is set, all your content will begin to coordinate better. Go the Appearance – Customize and a new column will appear on the left side. Once you pick colors and fonts for your blog, you can add that information to your dashboard and customize your theme to match. Make sure to copy down the hex codes for the colors so you can add that rather than trying to match the color online. A logo is not essential to start a blog but it helps to start your brand in the right direction. If you do have a logo for your business, use that to continue your branding. You can create free with Photoshop, Word, Page, PowerPoint or Canva. The logo for this blog, I created in Canva with the logo design feature. You will want something as simple as one letter in color and font to change the favicon on your website. Leaving the standard favicon with telling everyone your a newbie and its so easy to change. On the WordPress dashboard, you access the logo on the customization tab and add your logo there to change the favicon. Add a good headshot and pictures of yourself are necesary because people connect with other people. It can be as simple as the photobooth app on your computer and cell phone to capture some pictures on a couple of different days. The homepage for this blog was candid shot from a family vacation in Aspen. If you are need of more background pictures you can get stock photos on Canva, Unsplash, and Shutterstock. Make sure you follow copyright laws and cite any images accordingly, though. Even free images may have some requirements for citation. You will need to create the basic pages for your blog. The pages should include home, about, contact, and legal pages. The plugin Astra Sites has templates for websites with all of these pages that you can install. Also, Divi has some amazing templates for home, about and landing pages that you can download and customize. The templates make creating these pages quick and easy. Otherwise, you can create each page by going to “pages” on the Dashboard and choosing “Add New”. You can use the Gutenberg blocks to design a page or a page builder plugin that I showed you earlier. Your home page and about page will likely be the most visited pages on your blog. You hope that after someone enters your blog, they like your content enough to find out more about you. Blogs, especially if you plan to make money, need at least 3 pages, sometimes more! I was too nervous about all this legal talk to even try to fill in a standard form myself. I found a real lawyer who is also a blogger and purchased my legal pages from her. I wasn’t taking any chances on the “free” program here. This is a coupon for an extra $30 off the bundle of 3 Best-Selling Legal Templates + 9 Bonuses. Congratulations your WordPress website is set up and ready for you to start blogging! (If you need more direction to set up your website, enroll in my free course on How to Build a WordPress Website. The steps to creating your website are the same for a blog). The free course is a full tutorial with step by step instructions and videos to follow. To start a new post – go to the Dashboard menu and choose Post. You will see a section “Enter title here” where you can type the title or headline of your post. Then under that is the area for writing content. You can just start writing in the blank box and use the Gutenberg Blocks to create your post. 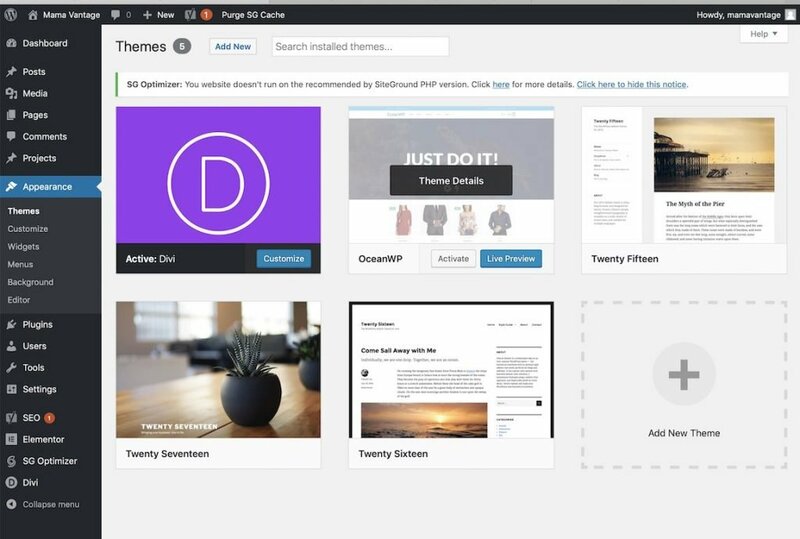 If you have chosen Divi Theme you can start creating a post in the Divi Builder. A purple box will ask if you want to build in Divi. The first pages on your blog should be in in-depth articles about a very focused topic in your niche. The foundational posts serve a couple of purposes. First, you will begin to establish your expertise in an area. Expertise is important to both your audience and Google. Your audience will know and trust you more if you are genuine and can show a knowledge of the subject. Gaining Google’s favor is important so that your blog will be shown when someone searches for information on your subject. Search Engine Optimization (SEO) is basically figuring out how to match the keywords in your blog posts with the words that people are using to search for the information you are writing about. Then establishing your expertise with the search engines (Google, Bing, etc) so that your content is shown to those people searching for the information. Additionally, as your blog grows you can interlink and refer back to these foundational posts. (Google like this too). Interlinking will help with your ranking with Google and keeping people on your blog longer. Figuring out what to write about is where DTC really shines. So if you are serious about starting a blog for profit and you need more help on content that makes money, you really need to become part of the Dare to Conquer family. Once you are done writing – publish your post. That sounds so fancy but it is as simple as pressing the publish button. You are officially a blogger – you have a blog post out there on the internet. Once you are up and running now is the time to start getting real people reading your amazing insights. Because your first post is the start of a future in writing, you will need to develop a content strategy and publishing schedule. Start thinking about what will you write about and how often will you publish posts. Once you have content published you need to promote it for people to read. Nothing will magically happen once you hit publish. In fact, no one will ever know you exit if you don’t promote your own blog. SEO is important for people to find you on Google, but that takes a long time. So make sure your posts are optimized for Google but then focus on promoting in other ways in the short term. Choose one social media platform to focus your promotions on. Of all the social media platforms, Pinterest is probably the best. Pinterest acts more like a visual search engine and drives thousands of page views for many bloggers. Check if other people are promoting content similar to your on Pinterest. If so, then use Pinterest. If not, figure out where your audience hangs out and head over there. I focus on Pinterest and use Tailwind as part of my pinning strategy. Once traffic is flowing in you will want to convert your readers to subscribers of your email list. If you want to be a professional blogger and make money, you need to look professional! SiteGround (and other hosts too) will give you an email address that matches your domain name. This is the most simple and cheapest (free) option. The other option, I recommend is to sign up for a GSuite account and have your email along with the other features of GSuite. This option allows you to add additional email addresses for other employees or contractors and gives you access to GSuite but does cost the minimum of $5 a month. So your blog is launched and you’re growing your audience. Now is the time to learn to monetize or start making money with your blog. Monetizing your blog takes time and work. Although there may be 100 different ways to make money, most blogs are monetized in a few most common ways. Affiliate Marketing. Affiliate marketing is basically selling another company’s products or services and making a commission. Advertising – Blogs can sell ad space on their site to a specific company or an advertising agency that places ads and pays the website owner. Selling your own products or services – frequently a blog is an avenue to promote your existing business or new products and services. Flip your website – you can even create a website and start to build a business and sell it for profit. The courses at DTC cover monetization in depth. In fact, that is why DTC exists, to help you start a money making blog. If that is your complete focus then you really need to check out the Dare to Conquer family. When you are first starting your blog you be bootstrapping and have very little money to invest. In fact, that is the beauty of blogging compared to other businesses that require a lot of capital investment. You can start your WordPress blog with the minimum cost of hosting and you are up and running. I have a free course to help you build a WordPress website and writing your blog – this is a gift just for my readers – WordPress Website Course here. You can follow along, create a website for your business and start writing blog posts. If you want to develop your blogging skills and your business faster, you will want to invest in more education and tools. Congratulations! You created a website and started a blog! Seriously, I’d love to have you in my free course so you can build your website this weekend. The steps are so easy to follow and you will be albe to follow along with the video tutorials. How to write a blog post and publish it. This was a lot to get through! I tried to cover everything you wanted to know about how to start a blog in 2019. It is your turn now! Ask away! What other questions do you have about starting a blog and growing your business?